Oatmeal usually refers to coarsely ground oat groats or oat porridge. 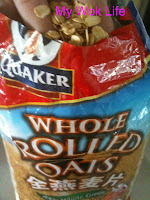 There are many types of oats e.g. 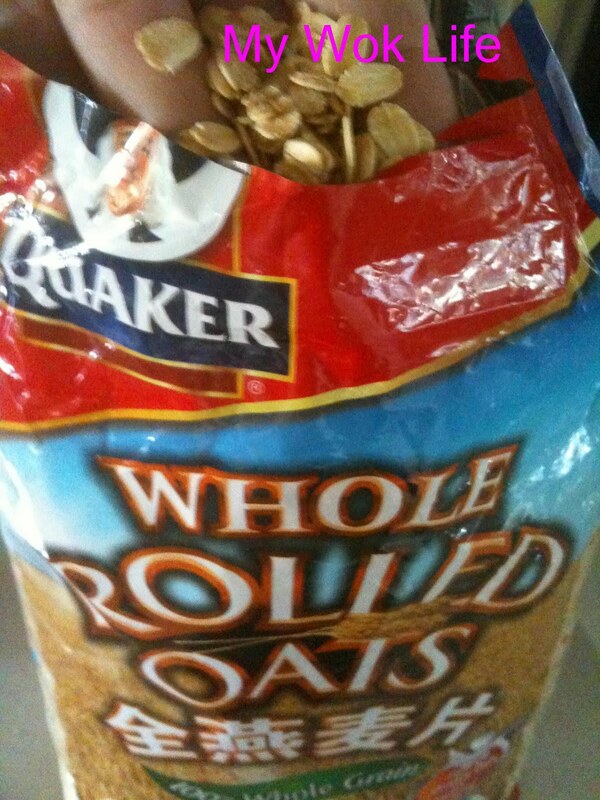 old-fashioned rolled oats, quick oats, and steel-cut oats. Old fashioned rolled oats are whole oats rolled into flat flakes, and then steamed and lightly toasted; Quick oats made the same way but cut into smaller pieces to cook faster, whilst steel-cut oats are whole raw oats cut into smaller chunks which take longer to prepare. As for instant oats, they are finer and thinner pieces, but usually with addition of salt, sweetener and other flavouring to make it consumable almost instantly. However, all the oats are generally high content fo complex carbohydrates, low GI and water-soluble fiber which encourages slow disgestion and hence, stabilizes blood levels. All these oats also help to reduce cholesterol level in our body. Use rolled oats to make this cake, it’s OK to use either old-fashioned or quick oats as it’s just a matter of heating time with variation of 1 – 5 minutes. Many love chocolate flavour. To make it less oaty taste, I added also chocolate to create marble butter cake. Otherwise, it will be just simple oat butter cake, if it’s without walnut bits and chocolate marble. It’s up to you. By and large, this cake creation wasn’t tasted too sweet, yet, aromatic with a touch of buttery as well as chocolatey flavour. 2) Preheat oven to 160C, for 20 – 30 minutes. 3) Cream hard butter and sugar in a mixing bowl at medium speed till fluffy, for 15 minutes. In the meantime, melt chocolate bar with double boiling method listed above. Keep the melted chocolate in the hot water pot as it is, to keep it warm. 4) Reduce speed to low, mix in eggs slowly, in stages (one egg at a time). Add vanilla essence. Then, increase speed to medium again to mix well, for about 3 – 5 minutes. 6) Add in walnuts and stir to combine. Then, add in melted chocolate and scatter in the cake mixture with spatula, to create marble pattern. 7) Pour cake mixture into baking tin and place at middle rack in oven to bake for 40 minutes. Leave at rack to cool before removing from tin. Divide into 10 big slices or 16 small slices to serve. 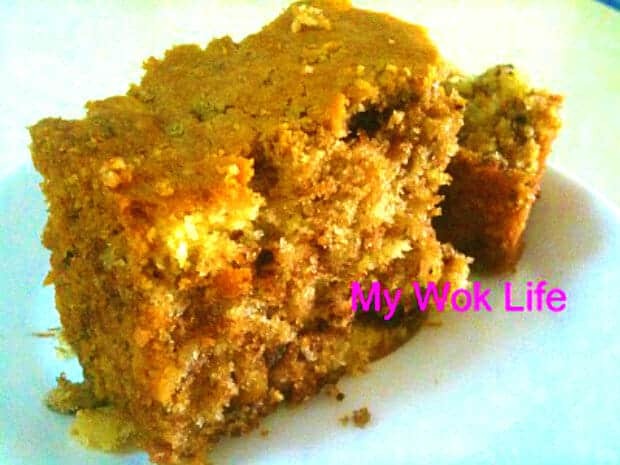 A small slice of my oatmeal & walnut marble cake counts about 200kcal. Variations: Replace walnut bits with almond flakes or raisins. Or, do without any nuts, simply taste the true oaty flavour! Tips: Stir in melted chocolate may resulted in full chocolate flavoured cake instead of marble pattern. So, to create nice clear marble pattern, extra effort is needed here. Scoop a small portion of cake mixture out from the main mixture bowl, and place in separate bowl. Stir in the melted chocolate to combine well. Then, return the mixed chocolate portion to the main mixture bowl and use a chopstick to scatter briefly to create marble pattern. * It’s convenient and tasty to use instant oatmeal, but instant package usually comes with additional sugar and other flavouring. Hence, you may opt to reduce the sugar amount by 10 grams.